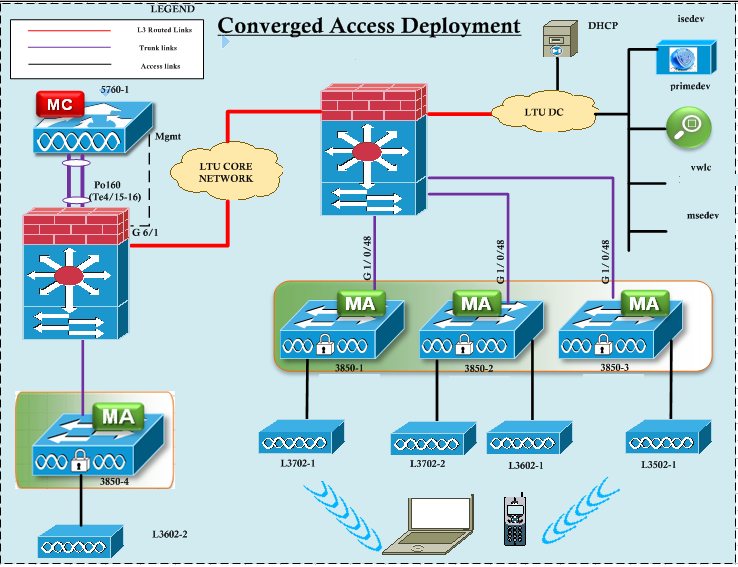 In most of the practical scenarios, you have to place a 5760 controller in a existing CUWN (Cisco Unified Wireless Network) environment. In this post we will see how to configure a WLAN on 5760 to support those CUWN setup. Writing out the event log to flash:/event.log . *Dec 16 01:59:01.461: %CAPWAP-3-ERRORLOG: Did not get log server settings from DHCP. Once you configure the 5760 as primary controller for this AP it will successfully register to it. *Dec 16 02:04:08.490: %CAPWAP-3-ERRORLOG: Selected MWAR '5760-1'(index 0). Now if you look at 5760 end you can see the successful AP registration. We will change the AP name to L3502-2 using “ap name <old_name> name <new_name>” CLI command. Let’s create a WLAN called “LTUWireless” with open authentication. (In a later post we will change it to dot1x with AAA override). Since I am creating it as open, I do not want to many users connect to it. So I disabled the “broadcast SSID” feature. Here is WLAN summary information. 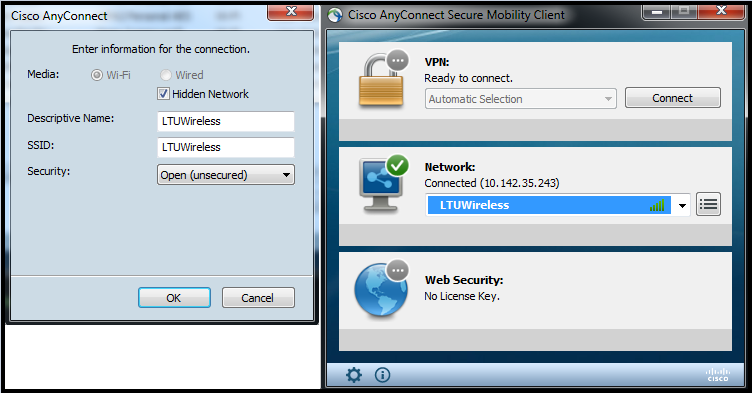 Now you can test your client connectivity.As you can see my AnyConnect client get connect to this SSID. You can verify clients detail on 5760 CLI as well. In next post we will see configuring RADIUS on 5760 & make the WLAN is dot1x. we got 4 of these 3850 switches and i cannot simply wrap my head for a proper design…if you stack them up like using two switches per stack i.e. it gives you a capability to connect 50 AP’s per stack ..none of the floors can be big enough for that many AP’s. (unless a very dense deployment keeping in view the dictate of connecting AP directly to this switch), If we plan to use an individual 3850 switch on each floor i.e. 8 floors and 10 K each for this switch means 80K ..looks kinda unjustifiable . and cannot find much documentation about the inexpensive version of it…3650’s..they both looks sort of same on paper, but i doubt that 3650 would not be able to handle that much of load..will appreciate if you can give some insights to 3650 and its caveats..
Below should give you answer to your query. 3850 support 50 AP & 3650 support 25AP & stack bandwidth is much more higher in 3850. When you look at justification, this should consider as your Access Switch infrastructure upgrade (not wireless upgrade). In summary if you have 3750 in your Access layer then 3850 would be the comparable product, if you have 3560 then 3650 would be the comparable product. COULD YOU EXPLAIN TO ME ON HOW TO CONFIGURE QOS ON THE 5760 CA CONTROLLER RUNING IN CUWN MODE , I MEAN ALL AP ARE TERMINATED ON THE CONTROLLER , WHAT IS THE BEST SSID IOS QOS THAT I CAN RUN TO ALIGN WITH THE INFRA QOS, I KNOW THAT I CN CREAT CALSS-MAP, POLICY-MAP AND ASSIGNE SPECIFIC BANDWIDTH FOR THE DOWNSTREAM TRAFFIC , WHAT ABOUT QUEUE , IM CONFUSED , DO YOU HAVE AN EXAMPLE .